The pictures above show: Doll Aurora (as it turned out that the picture she had faxed from her space module was of her daughter, Bennie Fitz); Janet Evans, the Olympic swimmer; the Santa Monica Bank coffee mug, full size and close up; and Dinah’s Restaurant, on the outside and on the inside, featuring the luxurious imitation red upholstered booth. You may wish to read two or three previous posts to fully experience the drama and the suspense of Planet Earth being rescued by financial benefactors from another World. “I will not yet have recovered from meeting you, Janet,” Hooknose McGee observed, philosophically, “Before I meet Doll Aurora. We are almost at Dinah’s front door. Could I have your autograph before we get there?”. “Sure thing,” Janet Evans replied. She took out a page of paper from her leather briefcase. It bore the letterhead of the Santa Monica Hyatt Hotel. She jotted some words down on the sheet of paper and handed it to Hooknose McGee. The limousine pulled into the parking lot of Dinah’s and dropped off the Olympic swimming champion and the Secretary of The Button. They walked to the front door, at arm’s length. Hooknose McGee opened the plate glass door and Janet Evans stepped inside, followed by her long- time secret admirer. They were seated by the hostess at a red booth. Janet Evans’s face turned red, “What am I, Abdul, chopped liver?”. Abdul Rahmeen turned to the Olympic swimming champion. “Janet, dear, liver is out of season right now. But can I interest you in a Dinah burger?”. 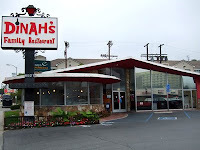 A waitress in a yellow Dinah’s uniform with a white sash came to the red booth and said, “Hi. I am Earline. I will be your server today. May I take your order?”. Hooknose McGee replied, “Janet has not been here before, so I will place our order. We will have three Dinah burgers, with tomatoes, lettuce, pickles and onions, extra onions, mayonnaise, Tabasco hot sauce, and Heinz 57 sauce. And for dessert, because we will have the Dinah burgers first while the pastry item is baking, we will have a large gourmet apple pancake toasted to a golden brown, with butter and maple syrup, and we will have three Dinah’s coffee mugs for coffee, and three glasses of water.” Earline wrote this all down on the order tablet, went to the counter in front of the 8 foot by 3 foot grill where two cooks were preparing 17 customer orders simultaneously, and attached the paper sheet to the carousel of metal clamps so it would be prepared in the order it was received. Through the large plate glass window of Dinah’s Restaurant, a strange-looking flying craft appeared in the sky, descending at a low rate of speed. It landed gently in the parking lot of Dinah’s. It was about 40 feet in diameter, pulsated with a greenish hue, and was etched in purple on the circular perimeter. A door receded upwards into the roof area, a set of small steps folded down to the asphalt-covered ground, and out stepped the visitor from another world. But she did not look like the picture that had been faxed to Hooknose McGee during his conversation with Doll Aurora on the Red Telephone. 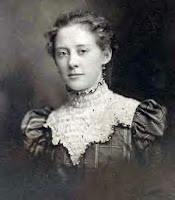 She was attired in an old-style dress with ornate sleeves, such as would have been worn by women in 1905. Soon Doll Aurora joined Hooknose McGee and Janet Evans at the red booth. Hooknose McGee stood up, respectfully, until Doll Aurora was seated. Hooknose McGee was on one side of the semi-circular red booth, Janet Evans was in the middle, at arm’s length from the Secretary of The Button, and Doll Aurora was on the other side, at arm’s length from Janet Evans. Doll Aurora added cream to her coffee cup. Janet Evans spoke first. Earline appeared at their red booth with the three Dinah Burgers. Hooknose McGee said to Earline, “Can I please have some Tabasco hot sauce and Heinz 57 sauce?”. Earline replied, “I can get you some hot sauce, but it is not Tabasco brand. But the Heinz 57 is already on the table.” Then Earline left to attend other customers. The three began to eat their Dinah burgers. “This Dinah burger is really quite good,” Janet Evans said. “Doll Aurora, may I ask you,” Hooknose McGee inquired, “Why is it that the real you does not look quite like the picture you faxed to me?”. “But, Doll Aurora, if you cannot exceed four times the speed of light without getting a ticket, would it not have taken you at least 1.89 million years to get here, since your Galaxy is seven and a half million light years from Earth? How could you shorten that trip to just 104 years, and how do you stay young looking after the passage of such a long period of time?”. 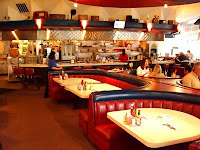 The manager of Dinah’s, Abdul Rahmeen, brought a 10 X 14 photograph of Hooknose McGee wearing a dark Olympic sweatshirt to the red booth where the three guests were enjoying their Dinah Burgers. “Hooknose McGee, my office manager printed out a copy of your blog picture. Will you please autograph it before I add it to our celebrity wall?”. “Sure,” Hooknose McGee replied. “Janet, can I borrow your ink pen, please?”. Earline brought the large gourmet apple pancake to the red booth and cut three slices, placing the serrated cutting knife on the table beside the large porcelain plate. The large gourmet apple pancake was toasted to a golden brown and had a strong aroma of brown sugar and apples. “Janet, you need to drown this in maple syrup,” Hooknose McGee advised, drawing on his 13 years’ experience of pigging out at Dinah’s that were ended by thousands of miles and poverty. “Doll Aurora,” Hooknose McGee stated, “I love you for your money.” Doll Aurora gave no visible response, but seemed to be really enjoying the large gourmet apple pancake drenched in maple syrup. She took a long swig of coffee from her white porcelain coffee mug with the Dinah’s monogram emblem etched on it. “Do you love me, Hooknose McGee?” Janet Evans asked, concerned. She had a sense of trepidation that when the post-Button Push celebration meal was over, Hooknose McGee might leave with Doll Aurora on a long space flight, leaving Janet Evans to wait on tables for two years to pay for the hazardous materials team to clean up the site of the space ship landing. “Ah ah ah!” admonished Doll Aurora, waving her finger from side to side in the newsletter editor‘s face. “Hooknose McGee, look at me!” Doll Aurora ordered sternly. “Didn’t I tell you there were 70,000 branches of Dinah’s Restaurant within 28 light years of Earth? Huh? Answer me, you dyslexic Button Pusher, you!”. Just then, the President of Santa Monica Bank, Henry Kaspryak, accompanied by JBQ, came to the red booth where the three guests were enjoying their large gourmet apple pancake. Through the large plate glass window, rain could be seen cascading down from the sky in torrents. The two visitors to the red booth were dressed in three-piece suits. Mr. Kaspryak said, “Doll Aurora, we were facing some tough years ahead before our global economy recovers. Thank you very much for going on a very long trip through space to bring us 24,353 trillion dollars. I think we can get back on our feet now. As a token of our appreciation to you and the Universal InterGalactic Bank for reaching out to the people of Earth, it is our honor to present you with this plastic card imprinted with the name 'Doll Aurora' which is a lifetime pass to any Dinah's anywhere in the Universe. Also, we would like to present you with this Santa Monica Bank coffee mug with a $2 bill encased in the transparent wall." "Thank you, Mr. Kaspryak," Doll Aurora said, her eyes lighting up. "This lifetime pass to Dinah's will really come in handy." Hooknose McGee, caught off guard and trying to be modest about following the rehearsed plan precisely as he sat nervously in front of the Red Button and the Green Button, stated humbly, in much the same manner that Jim Thorpe had answered the King of Sweden after winning the Olympic pentathlon, “Thanks, JBQ.” JBQ and Mr. Kaspryak bowed cordially to the three guests sitting in the red booth, and quietly left the dining area. “Congratulations, dear,” Doll Aurora said. “I will never forget you,” Janet Evans said, reaching for another delicious bite of the large gourmet apple pancake. “Do you mean me, or the pancake?” asked Hooknose McGee, feeling insecure. “Why, the pancake, of course!” Janet Evans replied, laughing. “I will be happy to take you on a round trip to the moon,” Doll Aurora stated, proud to show off the advanced technology of her home planet. Hooknose McGee exited the Red Booth and walked over to the Dinah’s Karaoke Stage. He picked up the microphone. “Testing. Testing. Ladies and gentlemen, can you give it up for Janet Evans and Doll Aurora?” Hooknose McGee said, pointing to the Red Booth where the two famous women were seated. The audience applauded reservedly. A murmur echoed around the restaurant, something to the effect of “We have heard of the blithe and bonnie swimmer Janet Evans, but who is Doll Aurora, and why is she staring back at me like that?”. Abdul Rahmeen dimmed the lights in Dinah’s Restaurant. Hooknose McGee began to sing the altered lyrics of an old gospel classic. And so divine to eat! The mystery of what happens to left over hamburger buns after the hamburger and ketchup is consumed was solved. They were thrown at Hooknose McGee as he replaced the microphone on its stand and returned to the Red Booth to rejoin Janet Evans and Doll Aurora. “I will be right back with a doggie bag,” Earline replied with a smile, clutching the gold Clonery coin tightly in her palm.